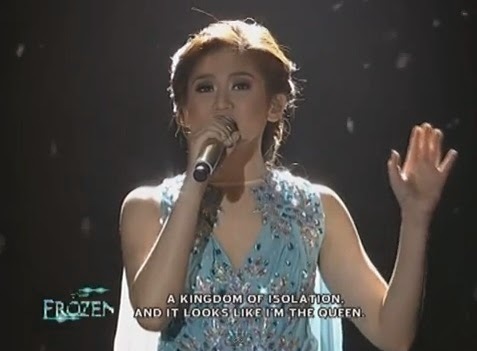 Manila, Philippines - Popstar Princess Sarah Geronimo on Sunday, April 6, 2014 made another heart warming performance as she sang Frozen's "Let It Go" on ASAP 19. The performance video is now viral online and among Twitter's trending topic. In just 6 hours, the Youtube video of Sarah G version of 'Let It Go' was viewed more than 82,000 times with more than 5,000 Likes. On Twitter Philippines, #LetItGoSarahGVersion topped the trending topics as her followers were amazed on her show-stopping rendition of “Let It Go” and after being compared with American actress and singer Idina Menzel's performance of the hit song. "Let It Go" won the Oscars for Best Original Song at the 86th Academy Awards, where the song was performed live by Menzel. Geronimo emulated the style of Princess Elsa from the Disney animated film "Frozen" in the said "ASAP" production number. This is part of tremendous celebrations and surprises to mark ASAP historic 1000th episode. This is not the first time Geronimo performed "Let It Go." Last April 2, a video of her singing the award-winning song during a recent mall show for the promotion of her latest album was also published by Viva Entertainment.